Welcome to EWPAL's home on the web! Thank you for visiting the EWPAL website. Please support the Concession stand to help keep costs down. Dogs are not permitted at the complex unless they are Service Dogs. For more information on current programs that are open for registration. Click the register Now button and you will see information and pricing on the program. Please place your orders quickly so that you can enjoy them for the FULL 2019 Season ! 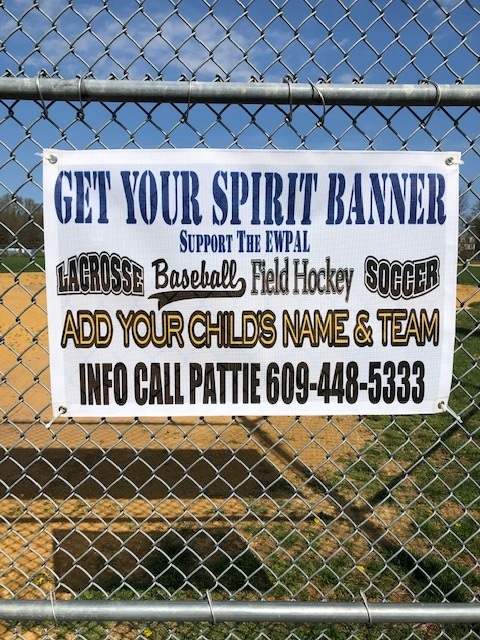 Banners will be placed on the fields near where your Child /Team plays to CHEER them on ..!!! You can do a banner for your child, family, team ect.... You get to choose what you want it to say! Finished with grommets and hemmed. Each Banner will be uniquely created/and slightly differ. 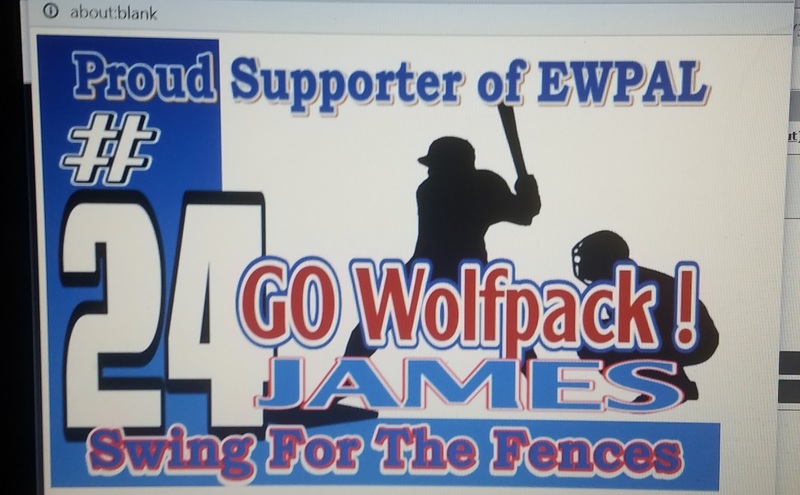 All proceeds from this will be directly applied towards the maintenance and upkeep of the EWPAL Sports Complex which benefits All Sports Programs & Families. As Always we are grateful for your participation. Below is a design already purchased from a parent ! Township Environmental Commission Promotes Arbor Day with Free Distribution of Tree Saplings on Saturday, May 4 (rain date Saturday, May 11) beginning at 10 am to 12 noon or until supplies run out. The Northern red oak saplings will be available on a first-come first-serve basis at the East Windsor Police Athletic League fields on Airport Road. Information about this variety can be found on arborday.org. We will Scan your Tickets and Email them to You if you pay online! Mon -Fri 10am -3pm ! If anyone is willing to help sell tickets please stop in the office and we will set you up with tickets to sell! Please Tell All Family Members / Co Workers & Friends ! 100% of Proceeds Go to the Up keep & Maintenance of the fields that Benefits All of the Sports Programs ! We can Not Do this Without ALL of You ! 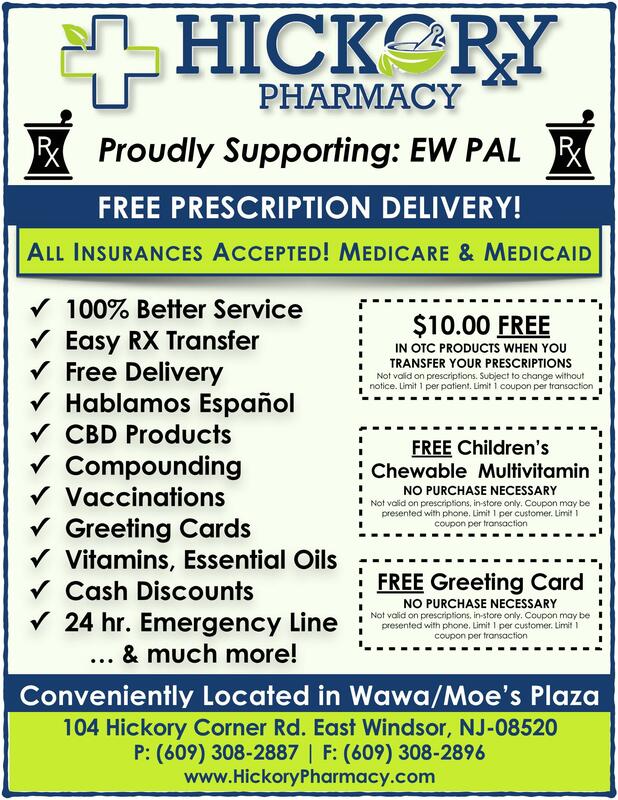 Our Sponsor Hickory Pharmacy is offering these great coupons for the EWPAL Families. Stop in and speak to Pharmacist Neil Raval you won't be disappointed. CLICK HERE to print coupons. Tickets Cost $12.00 each. Children under 3 are free if they sit on your lap. Everyone is welcome to attend this event! Tickets can be purchased in advanced now! We will distribute the tickets at a later date. You can either click on this link or go to the website under credit card payments. You can also drop a check or cash at the office. 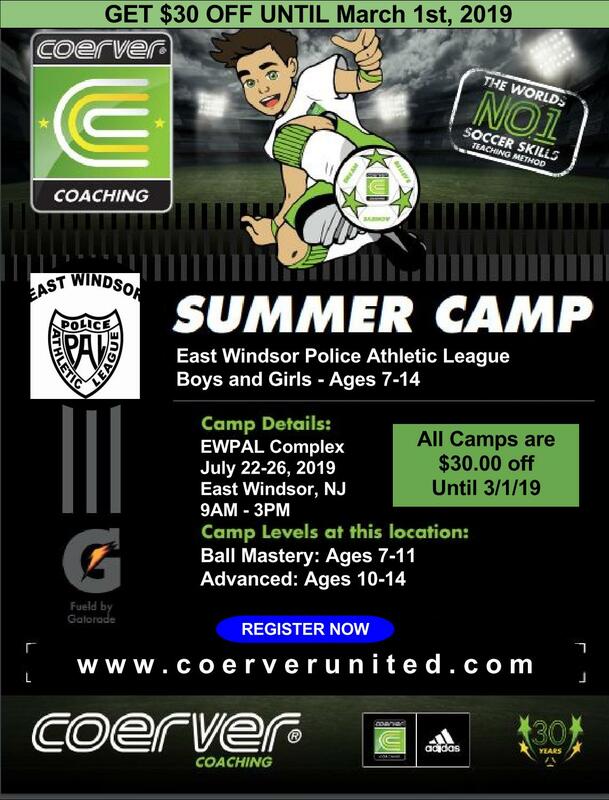 The East Windsor Police Athletic League is excited to announce the creation of our new Facebook Group Page. This newly created group will be used to post the most recent, accurate and up-to-date information on the PAL, the complex, the fields and any current promotions/events or issues. This group page is being created to facilitate the communication process through a social media outlet that many people use on a daily basis. The group page will alos be used for engaging all in the PAL community, in conversation, discussions, and individual posts or members sharing their child's experiences while engaged in PAL activities. Individual posts will be encouraged, along with the posting of pictures, positive or inspirational messages and other community related information, as it relates to the PAL, our Sponsors and supporters. The goal is to have all parents/guardians of registered children, all coaches, volunteers, alumni, alumni families and other validated community members request to join the Group Page for this interactive experience. In the very near future this Group Page will also link you to the Official EWPAL Facebook main page and the EWPAL website. Please log onto Facebook and go to www.facebook.com/groups/EWPAL. Please answer the three questions that pop-up which will expedite your approval to join. We look forward to making this a great interactive group page! For Teens 14yrs and older that are interested in certifying to become a Soccer Referee. When you pass the class send me an email and I will forward your information to the Referee assignor. https://smile.amazon.com/ch/23-7426097 and use your log in and Amazon will donate 0.5% to the EWPAL. Amazon will donate 0.5% of the price of your eligible AmazonSmile purchases to East Windsor Police Athletic League whenever you shop on AmazonSmile. Support your charitable organization by starting your shopping atsmile.amazon.com. ? During Open Registrations an Orange Register button will be on the right hand side of the screen. Click on the register now orange button. Choose the program you wish to register for. It will then prompt you to enter your email address. It will email you a temporary password. Once you have the password you will need to enter your info and each of your children's info. You will then be able to register for the program. You can pay with a credit card with no fee or mail a check. If the check is not received in 7 days the registration will be deleted. Log in with your email address and password in the top right hand corner of the screen. You will then see your family information. You name, Your spouse and your children's names. If you do not see your name click on MY ACCOUNT tab at the top of the screen. On the left hand side of the screen click the tab that says register online. Choose from the drop down the program you want to join. Then choose the correct age group. It will then show you a tab next to the children that are eligible to participate in that program click that tab. Answer the questions and hit submit. Or you can click on the Register now button on the Right hand side of the screen choose the program you wish to register in it will then ask you to put in your email and password. Payment must be made within 7 days for the registration will be deleted. If you can not make the full payment or need more time you must contact the office to assist you.